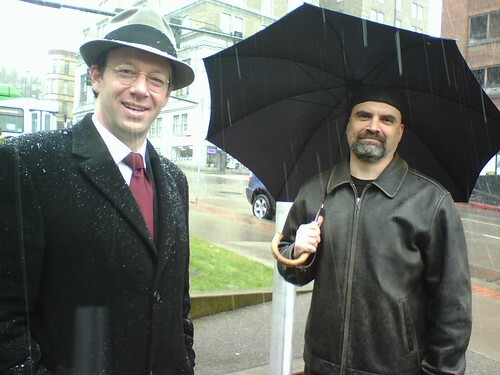 Congrats to Adam Manley for filming a great impromptu yet substantive video interview with Tacoma City Council Candidate David Boe. The best video interview of any candidate so far this political season. Read Boe's AIA award winning "Imagine Tacoma" series. Boe and Ferrell before the chalk offs in Frost park in the days of "Take back the park." Four months ago the Tacoma City Council voted 6-3 to build a surface parking lot at the vacant property on the corner of Pacific Avenue and 12th Avenue. The parking lot is being constructed at the request of DaVita Inc. with the help of state grants from Governor Christine Gregoire originally intended to help keep Russell Investments in Tacoma. The site, formerly Sauro's Cleanerama, is unique because of its prime location and also because it is dug out, sitting nearly 25 feet underground - a feature that might have been appealing to developers despite the site's history as an unintentional toxic dump for perchloroethylene, a dry cleaning chemical found there in dangerous levels until a joint effort between Tacoma and the Washington State Department of Ecology to clean up the mess. by Adam the Alien on 5/10/2011 @ 2:24am Hey Erik, if your'e going to link to me on Facebook (as opposed to YouTube or my .com), please link to my fan page ( www.facebook.com/adamjmanley ). I'm trying to pull focus away from my personal page, as I don't like getting friend requests from people I've never actually met or otherwise interacted with. 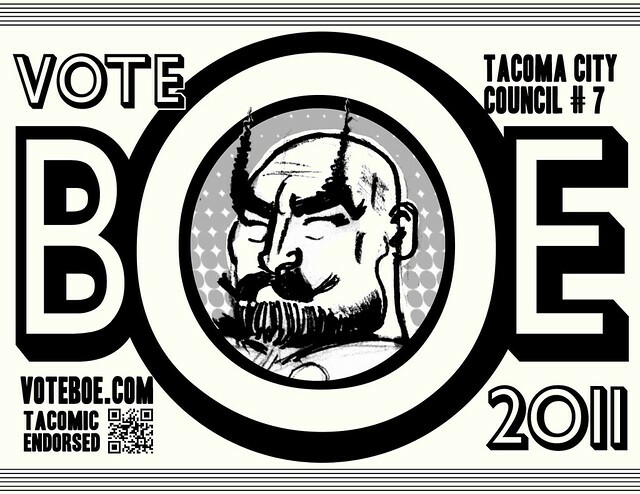 I can't wait to see how Mr. B kicks off his campaign on Wednesday. I plan on heading over there as early as I can, though I may be a touch late. by KevinFreitas on 5/10/2011 @ 6:29am Nice work with the video but, more, your questions of him. They may seem simple but you nailed it and got some great substance out of one of our candidates! by cisserosmiley on 5/13/2011 @ 5:46am where's Thor? by NineInchNachos on 5/13/2011 @ 7:56am you can use page-tile print method to tape together giant posters of the above PDF. fun activity for kids and bay windows!